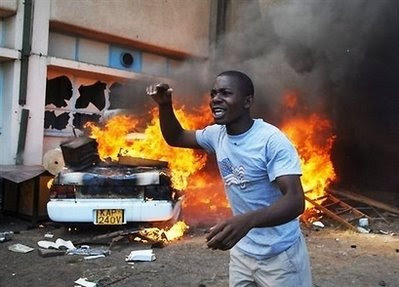 The ongoing election violence in Kenya left 8 dead today (March 7, 2008). Now, after his successful peace initiative in Kenya, Kofi Annan will join with anti-Semite Jimmy Carter, and Former President of Ireland Mary Robinson to bring peace to the Middle East in April. A council of world leaders launched by former President Nelson Mandela is sending a three-person team to try to help ease tensions in the Middle East, the organization known as The Elders said Friday. Former UN Secretary General Kofi Annan, former U.S. President Jimmy Carter and former Irish President Mary Robinson will visit Israel, the Palestinian territories, Egypt, Jordan, Syria, and Saudi Arabia April 13-21. “I have just completed an intense and grueling negotiation in Kenya and learned that conflict is easier than peace, but persistence makes peace possible,” said Annan, who added that in his former position he was acutely sensitive to the centrality of the Israeli-Palestinian crisis in the mind of many in the Middle East. Launched last year to celebrate Mandela’s 89th birthday, the group of 12 world leaders is dedicated to fostering peace and resolving global crises. Hopefully the wise Elders will be able to pursuade Hamas to put away their missiles and embrace peace.